Many Android users feel frustrated when of all their phone contacts have been erased accidentally. It is more frustrating when you want to call somebody urgently. The contacts can be deleted after you set Android phone to factory default settings, update Android OS, root your Android, and so on. So, how to get those important contacts back? Fortunately, your contacts are not really gone. There are some ways to get the lost contacts back. When you delete contacts from your Android phone, they are instantly removed from your device. However, they are still on the Google’s servers for a period of 30 days, before being permanently deleted. So, to recover contacts, you should be heading towards to Google’s servers to look for deleted contacts. All that you need to do is to login to your Gmail Account linked to your Android Phone and make use of the useful feature in Gmail that allows you to restore deleted Contacts. Let’s check how to recover your deleted contacts from Android using Gmail. 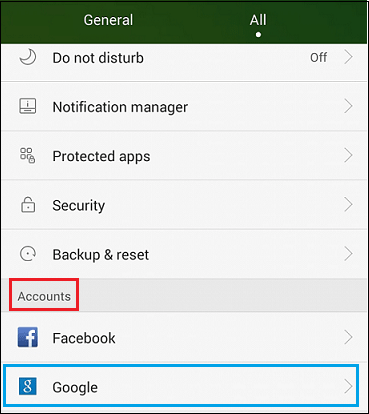 If you have not changed the Settings of your Android Phone, then you are set to automatically sync contacts with the Google Account linked to phone. This means that all the contacts and phone numbers that you add on your phone should be available in your Gmail Account. 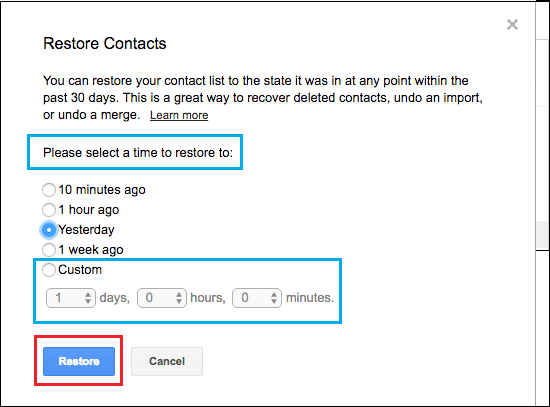 You can follow the steps below to recover deleted contacts from your Gmail Account. Using your PC, log in to your Gmail Account. 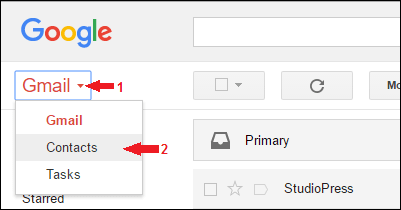 Once you are logged-in, click on the Gmail button, located at the top left corner of your screen and then click on contacts in the drop-down menu. 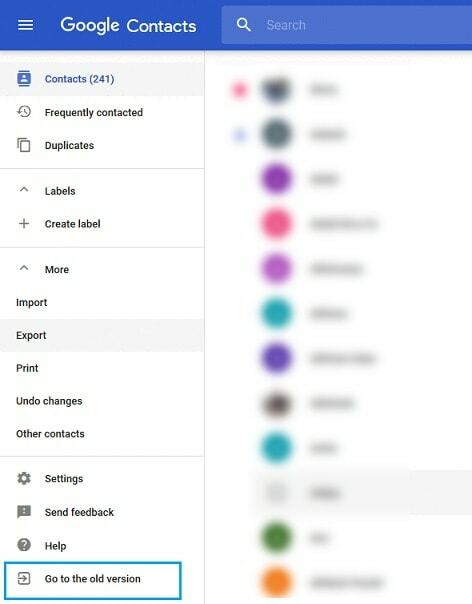 On the Contacts screen, you can see all the Contacts from your Android Phone that Google has attached to your Gmail Account. Note: If you have a new version of Google then click on Go to the old version. Once you see the list of your contacts, click on More to get to the drop-down menu, where you need to select the option Restore contacts…. Now, you will see a pop-up window, where you can select a backup, which can date back as far as 30 days. Select a Time from the options provided and then click on the Restore button. After the deleted contacts are restored, you will see a confirmation from Google that all your contacts have been restored. Note: Do not close your Gmail Account, as you may need to come back, in case Contacts are not properly synced to your Android Phone in the next step. After restoring deleted contacts in your Gmail Account, the next step is to Sync these Contacts to your Android Phone by following the steps below. On the Settings screen, scroll down to Accounts (or other Accounts) option located under personal section. From here, tap on Sync All option that appears. Now all your contacts from Gmail will now appear on your phone. In this tutorial, we use Honor 4C as an example. Other Android models have different options to sync the contacts. 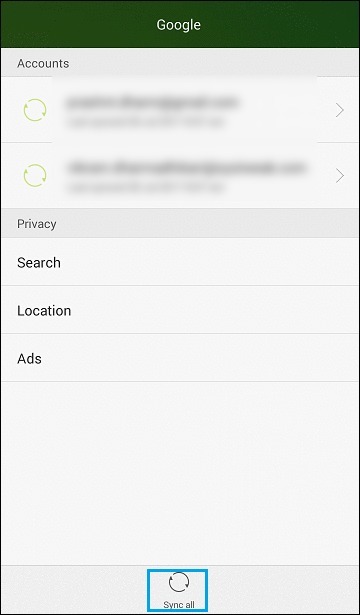 Take a good look at the contacts List to make sure that deleted contacts are back on your phone.